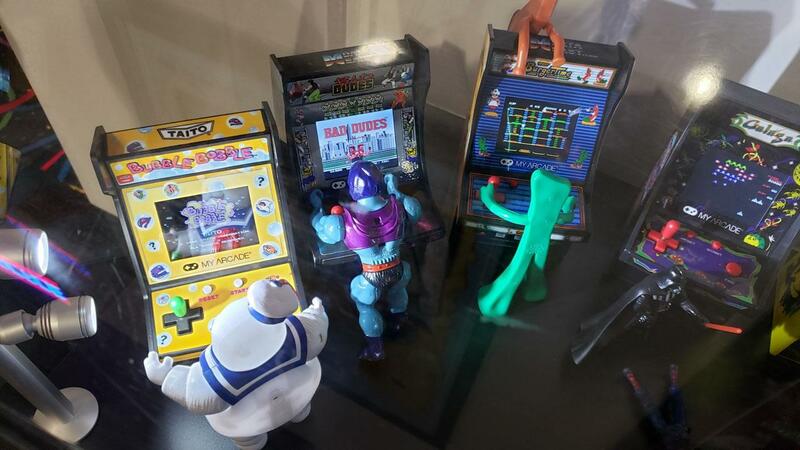 One of my surprised visits today was with My Arcade and seeing what cool retro gaming products they had. 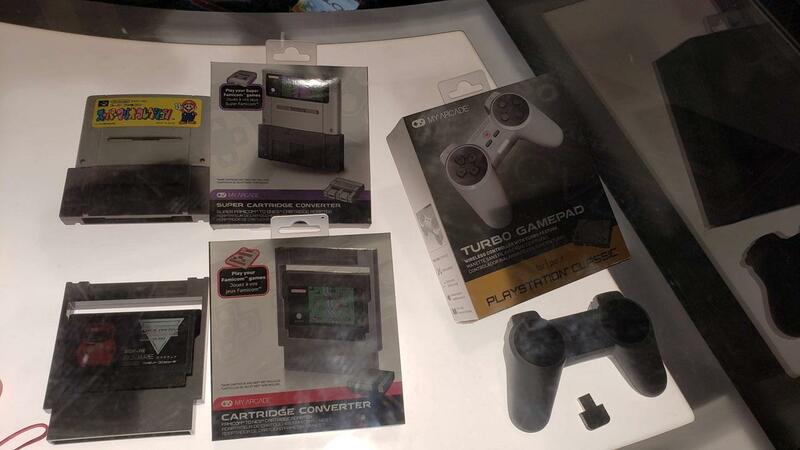 They announced their partnership with Taito a few days ago so you'll be able to get handhelds and mini replicas of some great old Taito titles. 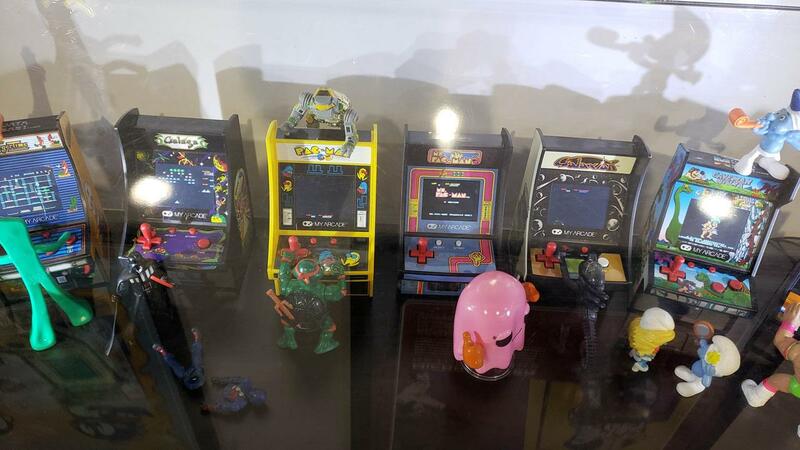 At the show, I was able to see in person Bubble Bobble and Elevator Action micro players that will retail for $34.99. 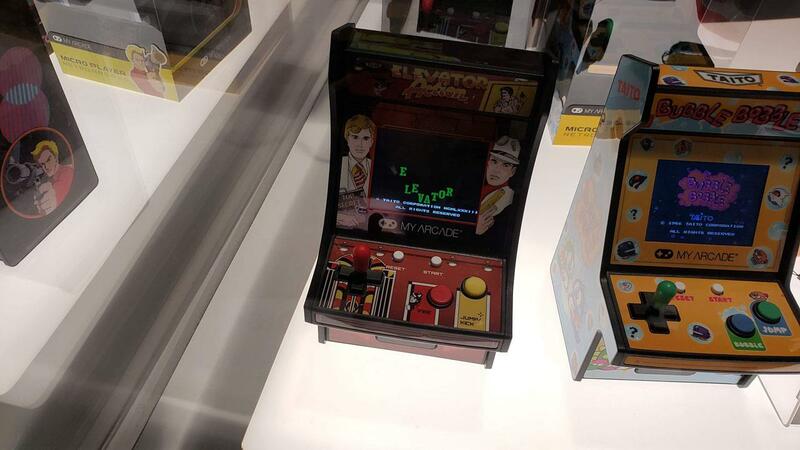 As with the other micro players, these two look exactly like full sized cabinets shrunk down to a tiny arcade machine. 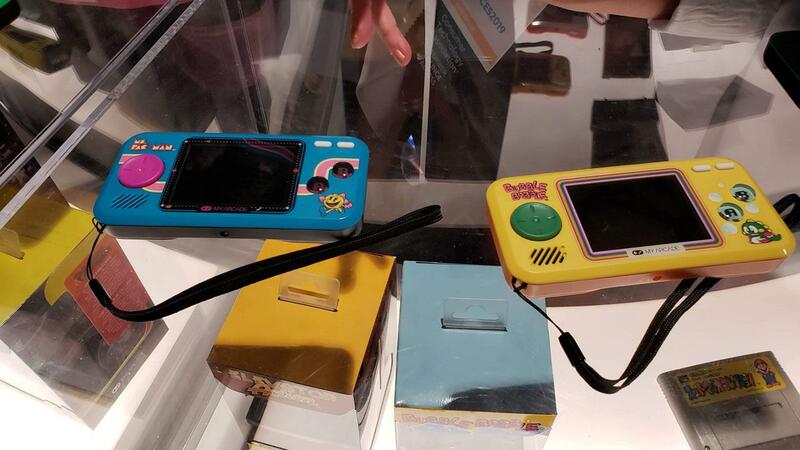 I'm not familiar with Don Doko Don, but a pocket player will be available as well for $34.99 with Don Doko Don 2 and Chack'n Pop. Also I have to mention that Bandai is on board and I was able to see one of my favorites, Galaga in person. 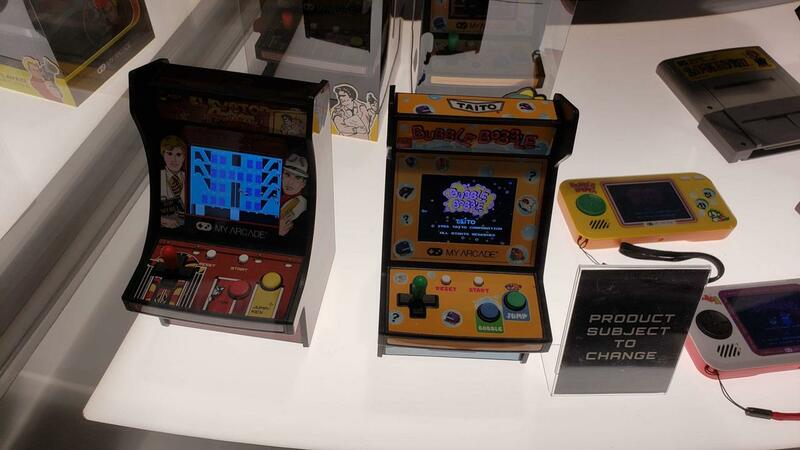 Ms. Pac Man, Galaga, and Dig Dug pocket players were on hand as well as a micro Ms. Pac Man unit. 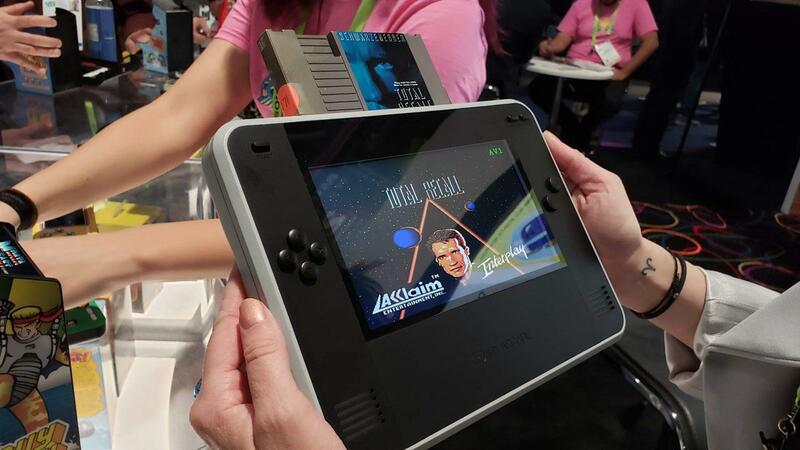 What I really loved seeing though was the Retro Champ Console. 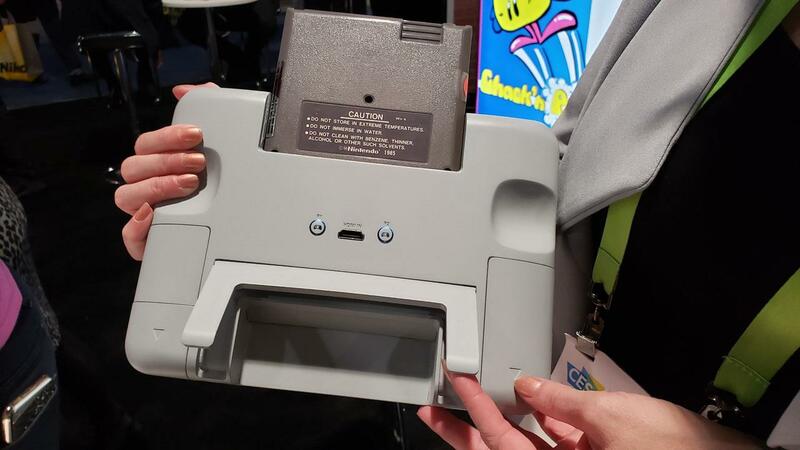 While it was in prototype form, it was working with NES Total Recall cartridge. The 7" screen was clear and had good color. Holding the Retro Champ felt comfortable and access to all the controls weren't a problem. They might change the left side from buttons to a D-Pad, which I thought would be a good change. The Retro Champ Console can use both NES and Famicom cartridges with the Famicon ones plugging in underneath the unit. There's support for two wireless controllers so you and a friend can play on the same screen. 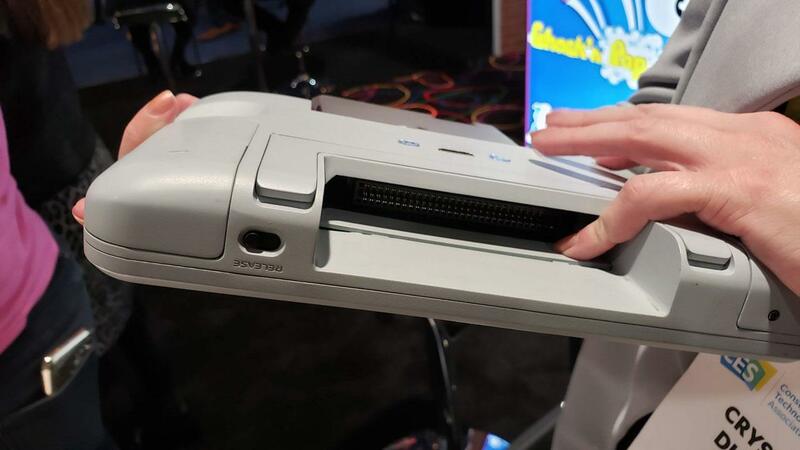 The back features a kickstand so you can prop it up as well as an HDMI port so you can play these on the big screen. Included in a hidden compartment is a cleaning kit complete with alcohol solution and some cotton swabs. As far as a battery life, how's about 35 hours? Yeah that's 3-5. There's still some work needed to be done, but hopefully, this $79.99 retro hand held will make its way to consumers hands later this year. 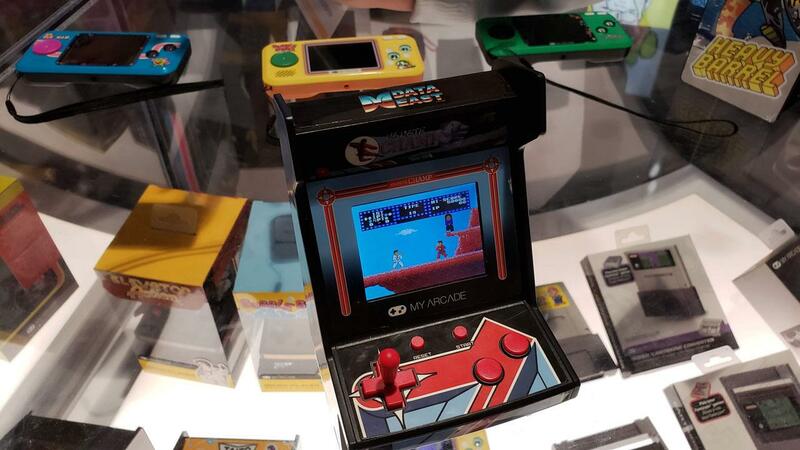 My Arcade has some nice little retro gaming products at the show and I know we'll have a lot of fans anxious for the Retro Champ to be released so they could use some of their cartridges they've collected over the years. 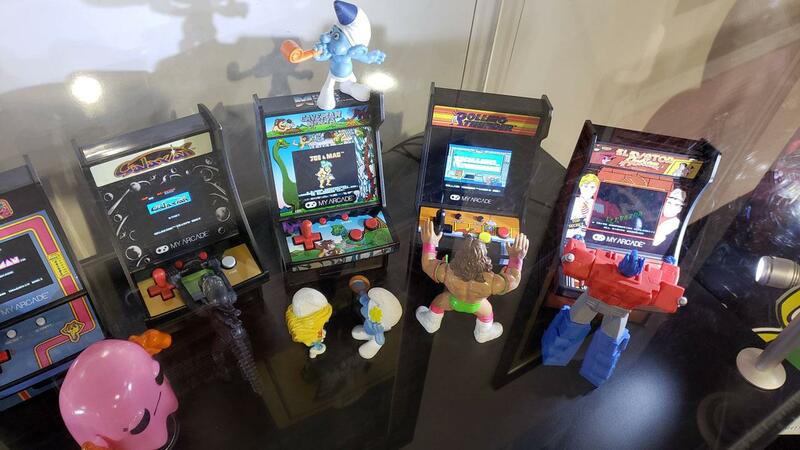 Bubble Bobble and Elevator Action Micro Players [MSRP: $34.99 each]: The same arcade cabinets that gamers know and love, scaled down to 6.75” for desktop play. 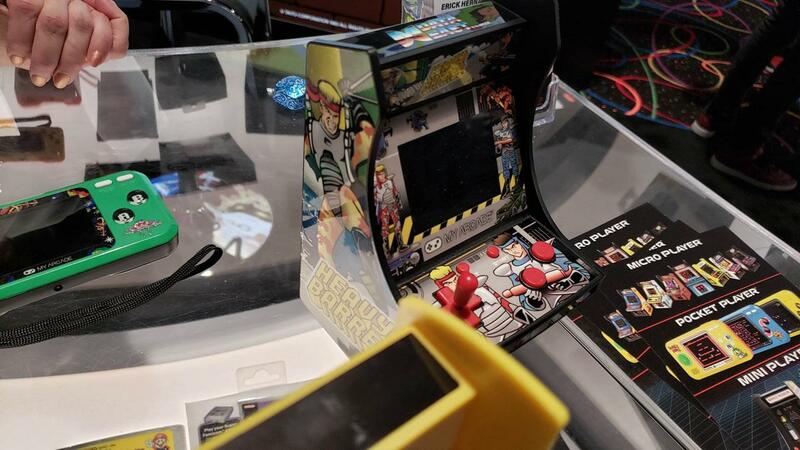 Each Micro Player features artwork inspired by the original arcade cabinets as well as a full color, 2.75” screen with volume control and 3.5mm headphone jack. Bubble Bobble Pocket Player [MSRP: $34.99]: Now gamers can get their retro fix on-the-go with the iconic titles Bubble Bobble and hard-to-find cult classics Bubble Bobble™ Part 2 and Rainbow Island™. These TAITO classics are available in portable format on My Arcade’s signature Pocket Player, featuring a 2.75” full color screen and ergonomic design. Don Doko Don Pocket Player [MSRP: $34.99]: For the first time on a handheld in the West, Japanese platform adventure game Don Doko Don and its sequel, Don Doko Don 2™, are available along with the quirky classic Chack’n Pop™. Players can enjoy hours upon hours of exciting action and challenging gameplay in a convenient portable format. 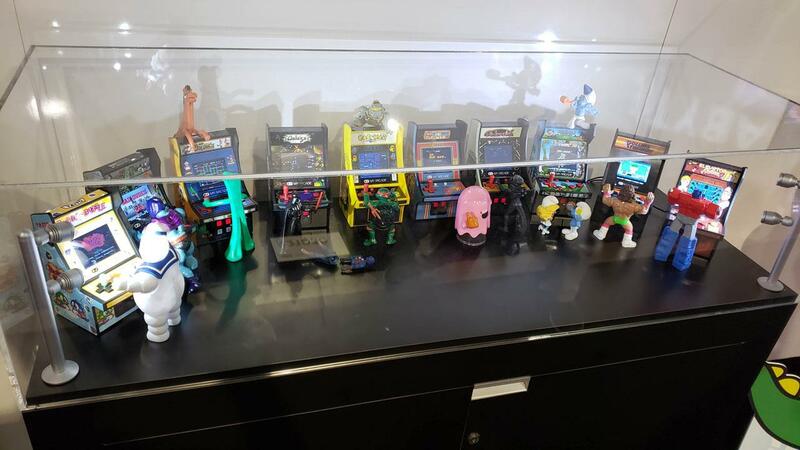 My Arcade expands its partnership with BANDAI NAMCO Entertainment Inc. to introduce one of gaming's first and most iconic female protagonists, Ms.PAC-MAN®, to My Arcade’s line-up of accessories. Ms.PAC-MAN® Micro Player [MSRP: $34.99]: Scaled down to 6.75” for desktop play, the Ms.PAC-MAN® Micro Player features artwork inspired by the original arcade cabinet as well as a full color, 2.75” screen displaying 8-bit graphics with volume control and 3.5mm headphone jack. Ms.PAC-MAN® Pocket Player [MSRP: $34.99]: This new Pocket Player includes fully playable 8-bit versions of Ms.PAC-MAN®, SKY KID®, and MAPPY® games. Featuring a full-color 2.75” screen to brightly display Ms.PAC-MAN® in all of her 8-bit glory, My Arcade’s signature Pocket Player is fine-tuned for hours of play through its emphasis on ergonomics and compact design. GALAGA® Pocket Player [MSRP: $34.99]: Shooter fanatics can now enjoy three out-of-this-world classics, GALAGA®, GALAXIAN®, and XEVIOUS®, on a compact game system perfect for retro gamers on-the-go. DIG DUG® Pocket Player [MSRP: $34.99]: Enjoy all time classic DIG DUG® and its lesser known sequel, DIG DUG®ll , join cult favorite THE TOWER OF DRUAGA® in an epic handheld which is sure to provide hours of enjoyment. The Retro Champ Console breathes new life into retro gamers’ NES and Famicom cartridges without the need for a legacy console. My Arcade’s new console includes a built-in 7 inch screen that allows for portable play with 35 hours of playtime via the built-in rechargeable batteries. Retro gamers looking to play from the comfort of their couches can connect the Retro Champ to their TVs via the console’s HDMI output and pair with My Arcade wireless controllers (sold separately). 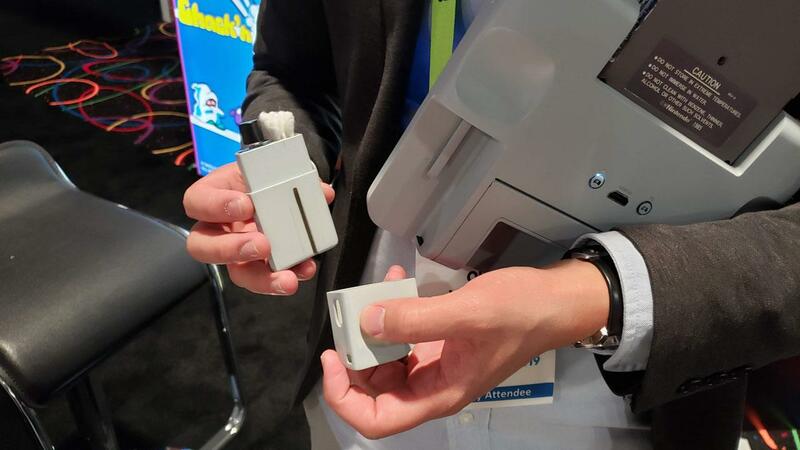 Also included is a built-in cartridge cleaning kit -- no more blowing on cartridges! 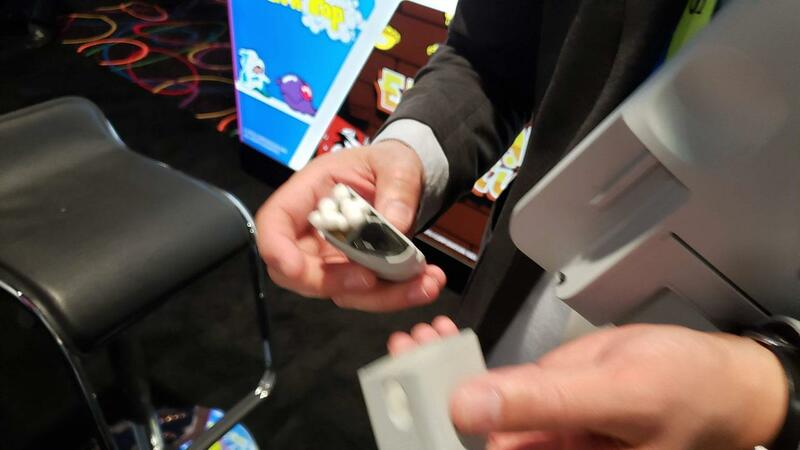 The device is ideal for game collectors, cartridge hunters, and convention/expo goers that need a portable device to test potential new purchases.